Hope you’re hungry! The grocery store of your dreams is coming to Nordstrom on Friday, May 25. 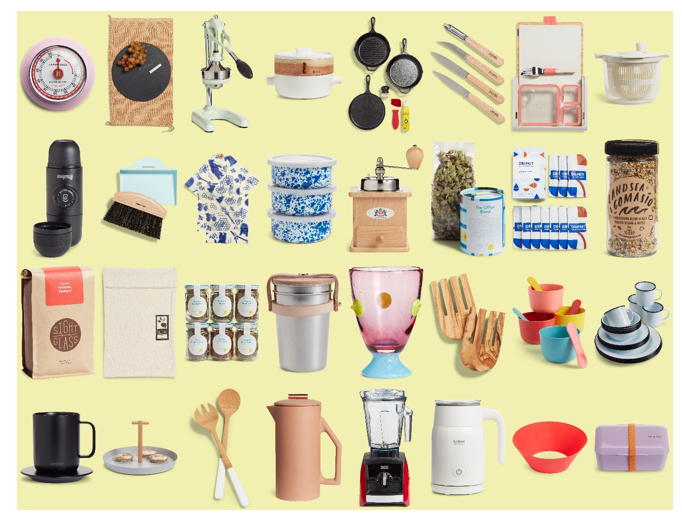 Stocked with cooking essentials and innovative appliances, eye-catching décor and serve ware, wellness favorites and specialty eats, treats and drinks, Pop-In@Nordstrom Eats More is a culinary destination for amateur and experienced chefs alike. Curated by Olivia Kim, food fanatic and Nordstrom vice president of Creative Projects, Pop-In@Nordstrom Eats More is a one-stop-shop for the world’s best foodie finds featuring items such as Aarke’s Sparkling Water Marker, Ember’s Ceramic Mug, Frywall’s Splatter Guard as well as notable brands including Staub, Sandoval, Vitamix, goop, HAY and more. Whether you are looking to host a party, prepare a quiet meal at home or just satisfy a snack attack, Pop-In@Nordstrom Eats More has you covered for the kitchen and beyond. Launched in October 2013, Pop-In@Nordstrom is an ongoing series of themed pop-up shops that transitions every four to six weeks to offer a new shopping experience and batch of new, often exclusive merchandise. Pop-In takes two forms: a shop curated around a theme featuring brands across different product categories (fashion, beauty, lifestyle, home/garden, sports/outdoors, etc. ), or a partnership with a single brand to bring “the world of” to customers. Pop-In@Nordstrom was built on a monthly rotation to keep customers coming back to discover new brands, new merchandise and create a fun and compelling experience in stores and online. Each shop features a mix of hand-picked merchandise spanning the high/low price range, with price points often starting at $5. Pop-In@Nordstrom was the first initiative from the Nordstrom Creative Projects team, under the direction of Olivia Kim (vice president of Creative Projects). In her role, Kim focuses on creating energy, excitement, a sense of discovery and a bit of disruption through engaging and unique shopping experiences at Nordstrom, both in-stores and online. Kim’s Creative Projects initiatives have established Nordstrom as a platform to test retail concepts, bring limited distribution collections to customers, and introduce them to the best up-and-coming brands and new talent. Pop-In@Nordstrom partnerships have included: Pop-In@Nordstrom partnerships have included: Aesop, Alexander Wang, Converse, Danish home goods brand HAY, design-driven wares from Los Angeles based Poketo, Everlane, Gentle Monster, goop, Hanes, home goods from Liberty London’s Flowers of Liberty collection, Nike, Opening Ceremony, rag & bone, the best of Korean fashion and beauty, The North Face, Topshop/Topman, the U.S. debut of Hong Kong fashion collective I.T., the Italian Trade Commission, VANS, and Warby Parker.